European countries were the top customers for proposed foreign arms sales by U.S. defense companies in fiscal 2018, according to the latest update of Bloomberg Government’s Foreign Military Sales Dashboard. 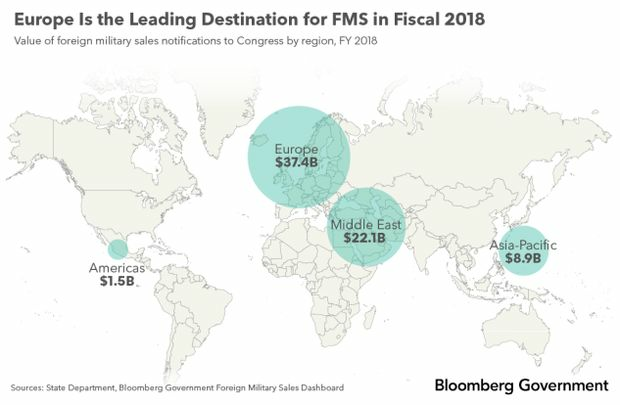 The 2018 FMS notifications — representing a total of almost $70 billion in sales — don’t represent deals that have closed, just intended purchases by foreign nations. President Donald Trump’s pressure on NATO members to spend more on defense, combined with regional fears of Russian aggression, may have contributed to Europe’s 2018 shopping spree. BGOV’s dashboard is based on the State Department’s notifications to Congress about potential military sales, which are compiled by the Defense Security Cooperation Agency. Congressional notifications are required for any potential sale that exceedscertain dollar thresholds. The 2018 FMS figures differ from Hooper’s number tallying closed deals because deliveries and payments may not take place for a number of years. The notifications data is useful for gauging trends in the level and types of equipment being sold to various countries and regions. The highest-value European notification was for a $10.5 billion sale to Poland of an Integrated Air and Missile Defense (IAMD) battle Command System (IBCS). The main contractors on this project are Raytheon Co., Lockheed Martin Corp., and Northrop Grumman Corp. The next-largest notification in Europe was for 34 Lockheed Martin F-35 Joint Strike Fighter aircraft to Belgium for $6.53 billion. The largest single notificationfor the year wasn’t in Europe. It was a $15 billion sale to Saudi Arabia for Lockheed’s Terminal High Altitude Area Defense (THAAD) system. Foreign military sales aren’t the only way foreign nations acquire military equipment made in the U.S. Foreign governments as well as other approved entities, such as law enforcement agencies, may purchase certain categories of military equipment through the Direct Commercial Sales (DCS) program. These deals are made directly with a contractor and are licensed by the Office of Defense Trade Controls at the State Department. DCS licenses are summarized annually in what’s known as a Section 655 report, named for the section of the Foreign Assistance Act that requires it, by category of equipment and destination country. In fiscal 2017 the total exported value of equipment through DCS was about $3.1 billion. Saudi Arabia was the top destination, with about $682 million in shipped goods. There is no publicly available data on which companies provided the equipment, exactly what the equipment was, and which entity in the destination country received the equipment.